Back when I was pregnant, early November-ish, the husband and I attended a charity function with my dad. At this function there was a silent auction with many different things to choose from. As a gift, my dad purchased an ENORMOUS magnum of french wine. The idea was that as soon as the baby was born, we'd crack that sucker open and all get snackered off the wine. Well folks, that happened last weekend. It was an appetizer, wine, birthday, welcome Avery party all-in-one. As part of the festivities, you were required to bring an appetizer and really what's better to eat with a classy bottle of french wine than pretzel wrapped hot dogs? 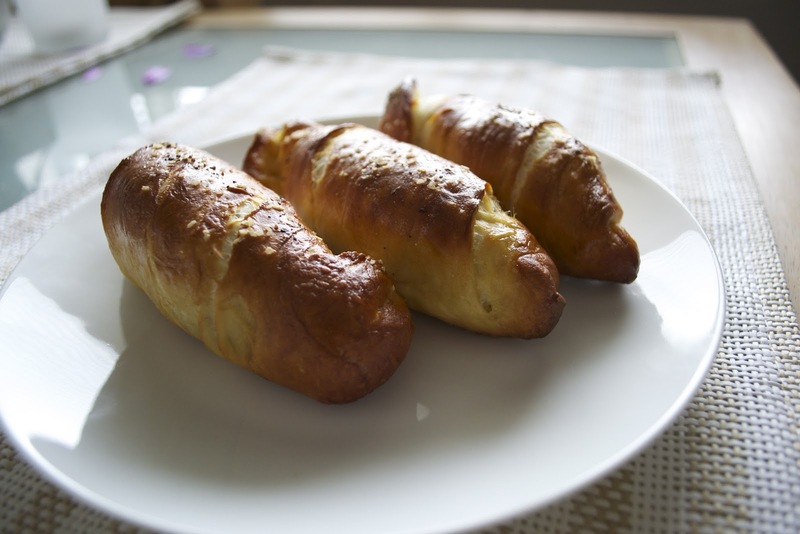 Chicken dogs, halved, then wrapped in homemade salty pretzel dough, dipped in mustard. They were a huge hit, and really simple and fun to make. 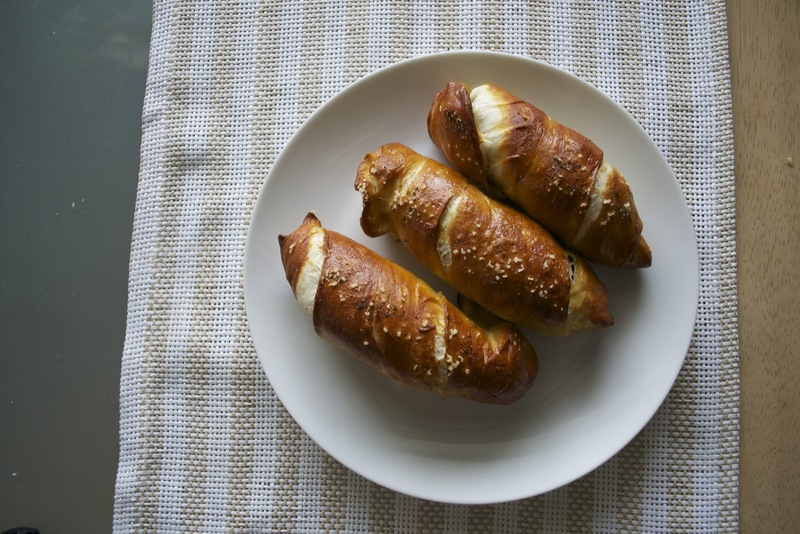 Get over your yeast fear and make some pretzel dogs! ps. 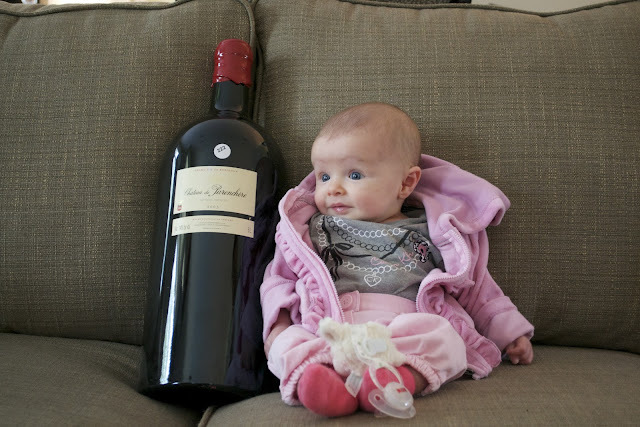 Giant wine bottles make babies look tiny. pps. We didn't give her any, don't be ridiculous. Makes about 16 pretzel dogs. In the bowl of a stand mixer, fitted with the dough hook, combine the warm water and sugar, sprinkle yeast on top and let rest for at least 5 minutes. Yeast should be foamy and smell, well yeasty, if it doesn't, throw away and start fresh. 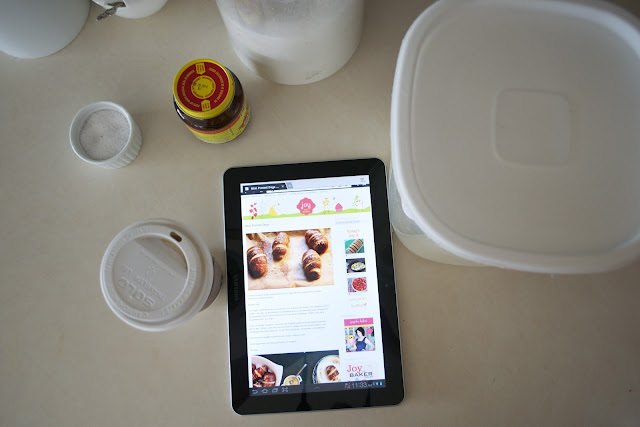 Add the flour, salt, and butter, mix on low speed until well-combined. Turn mixer up to medium and knead until smooth, pulls away from bowl, and forms a ball around the dough hook, around 6 minutes. Remove dough from bowl, it'll be kind of sticky. Lightly coat a large bowl with oil and place dough inside. Cover with plastic wrap and let rise until doubled in size, about an hour. Preheat oven to 425 degrees, line 2 baking sheets with parchment paper and brush paper lightly with oil. In a very large pot, combine the water and baking soda and bring to a boil. While the water comes to a boil, divide the dough in 16 equal pieces. Roll a piece of dough into a 12-inch rope. 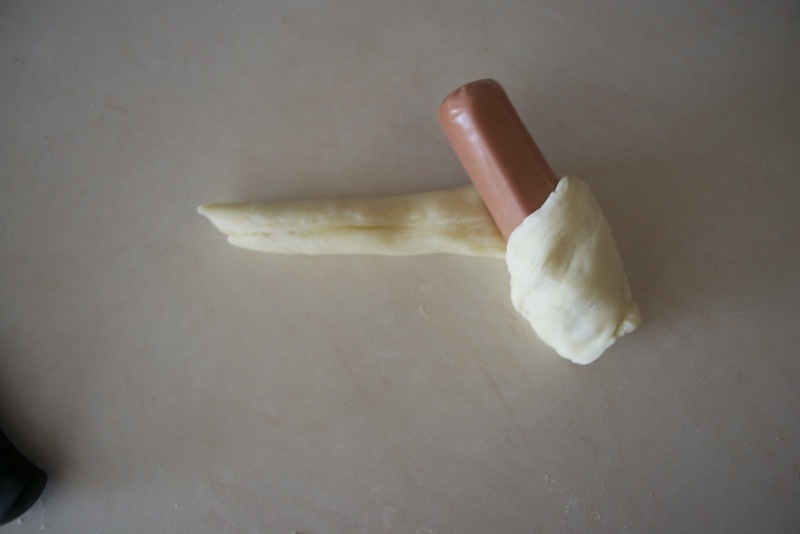 Start wrapping dough around the hot dog piece, making sure there are no gaps and pinching the ends when finished. Repeat until all the dough has been used. Place 6 - 8 pretzel dogs in the boiling water for 30 seconds. Remove using a slotted spatula and place on the prepared baking sheets, repeat until all pretzel dogs have been boiled. Brush with egg wash and sprinkle with salt and pepper. Bake for 12 - 14 minutes, or until dark brown and puffy. Let cool slightly and serve. They are best enjoyed the day they are made.